Debris covers I-57 where three vehicles collided on the ice-covered pavement Sunday morning. The wreck was one of several reported in Marion and Jefferson Counties from the ice storm that quickly turned surfaces to ice. 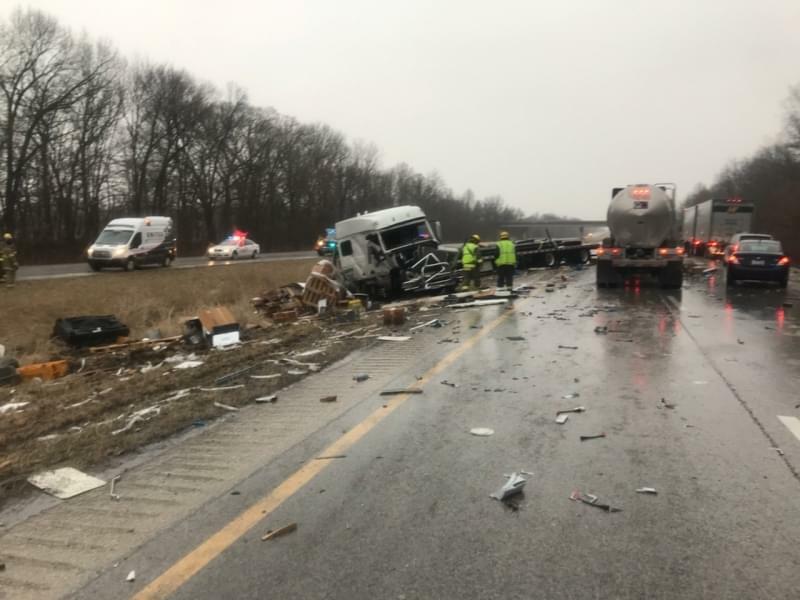 An early morning freezing rain is blamed for icy conditions that shut down both northbound and southbound Interstate 57 between Route 161 and the Dix-Irvington Road Sunday morning. Traffic had reopened going both directions by noon. State Police say two were injured in what turned out to be a three-vehicle crash on northbound I-57 at mile marker 107 a mile south of the Route 161 interchange. 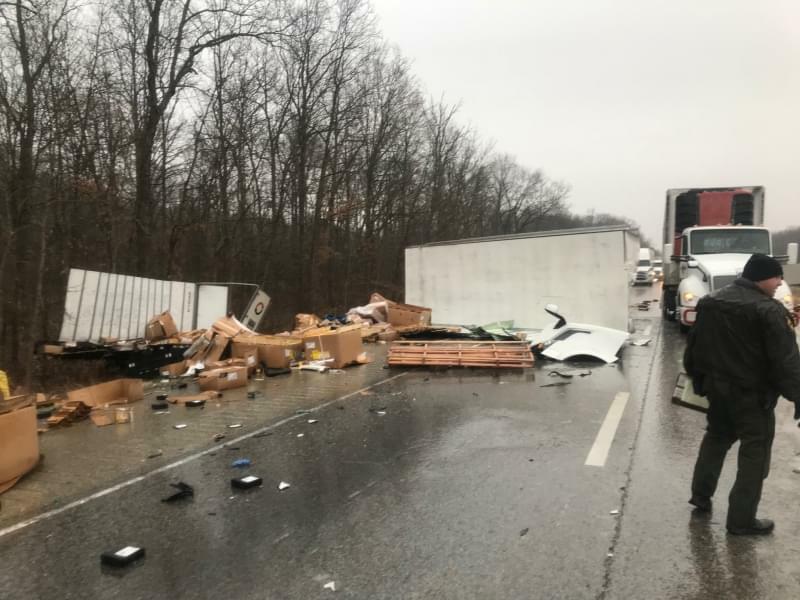 Preliminary investigative details indicate a semi driven by 34-year-old Mohamed Ahmed of Columbus, Ohio attempted to slow when seeing traffic in front of him break. However, due to the slick conditions, Ahmed jackknifed and came to rest in the middle of both northbound lanes. An SUV driven by 42-year-old Charles Yates of Plainview, Arkansas, was following Ahmed and came to a stop on the right shoulder. A semi behind Yates driven by 32-year-old Firooz Faseh of Houston, Texas failed to reduce speed and struck both the jackknifed semi and Yates. Faseh and a passenger n the Ahmed truck, 34-year-old Mohammad Faquiri of Houston, Texas, were injured and transported by ambulance to SSM Health St. Mary’s Hospital in Centralia. Charges are pending further investigation. Two semis collided nearby on I-57 southbound that closed the southbound lanes of the highway. There were no injuries in that crash. The Marion County Sheriff’s Department and Kell Fire Department assisted State Police at the scene. 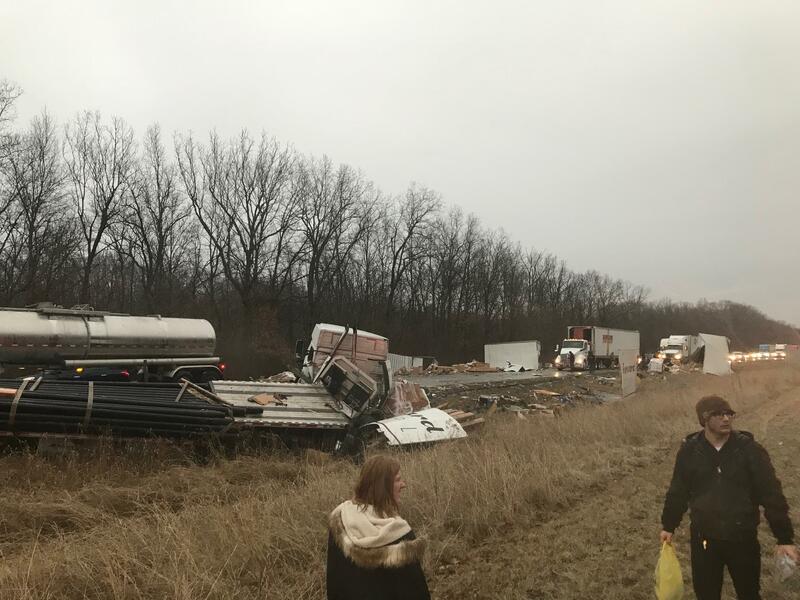 State Police and Marion County Sheriff’s Deputies also responded to a semi-truck that ran off southbound I-57 near mile marker 117 a mile north of the U.S. 50 exit shortly after six Sunday morning. The truck overturned on its side. Salem Fire Protection District Firemen assisted in getting a ladder to the driver so he could climb out of the truck. A car reportedly ran off into the median at the 128 miles marker near the Kinmundy exit. No injuries were reported in either of those wrecks. There were also multiple crashes blamed on the ice in Jefferson County. A semi ran off I-64 at mile marker 87 near Bluford. The driver refused treatment. There was a two-vehicle crash on Illinois Route 148 at the Bakerville Road southwest of Mt. Vernon. Two reported injuries, but only one was taken to the hospital. A car slid off Route 37 south at Saddle Club Road three miles south of Mt. Vernon and hit a guardrail. One person was taken to the hospital. All three crashes occurred just after seven Sunday morning. Reports are not yet available. One of the three vehicles involved in the northbound I-57 crash broke into four pieces making the scene appear to have involved several more trucks. Northbound traffic lines up behind Sunday morning crash on northbound I-57.